Raising a donkey as a pet requires some thought and preparation. Do you want a miniature donkey or a regular donkey? They come in many sizes and colors. Do you want to ride your donkey? Also consider whether you want to breed your donkey or not. Once you have made these decisions, routine care and feeding is similar regardless of the type of donkey you have. Read as many books on choosing and raising donkeys as you can find. Try your local library if you don’t want to buy them. If they have none available, ask about inter-library loan options. Think carefully about what type of donkey you want. 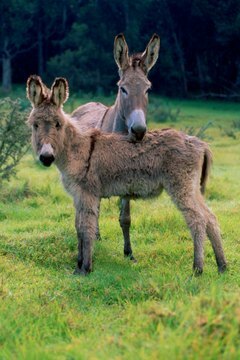 If you have no experience raising or training equine, you may want to choose an adult donkey as your first pet instead of an untrained youngster. Jacks should also be avoided if what you want is a pet only. Also consider price and personality of the animal. Build an adequate shelter for your pet donkey. It does not need to be elaborate. Make sure it is weather resistant for your location including wind and snow-bearing weather conditions. Enclose the shelter with a fence system. Tightly stretched, dive barbed wire should be avoided, especially if you have a breeding jack (male donkey). Try to use chain link or horse fence and allow as much space as possible for your donkey to exercise and graze. Feed you donkey properly to avoid illness and excess weight gain. Plain grass type hay is the best option, followed by alfalfa cubes if hay is in short supply. Occasional oat grain is suitable but try to avoid corn unless it is winter time and mixed with oats since it is a high in carbohydrates and fattening. Provide fresh, clean drinking water at all times. Place a salt and mineral block where it is accessible to the animal. Check the donkey’s hoofs frequently and have them trimmed as needed. Try to avoid having him shod unless the farrier advises it. Provide other preventative medical care such as worming and vaccinations as per your veterinarian. Play with your pet donkey often so he gets plenty of attention and exercise. Groom him as needed with a good brush, and trim his shaggy coat with electric clippers if it is extremely hot outside. Blanket him if the weather is excessively cold.